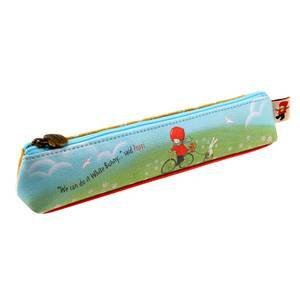 A pencil case for big adventures! Delightfully detailed with the endearing Discipline artwork in forest green and sky blue tones, Poppi and White Bunny are paddling on a water lily. The base and reverse of the pencil case are finished in a warm ruby red, and the reverse has pretty printed flowers to detail. Open the case with the brass effect apple shaped embellishment to find ample interior space and a nature inspired lining of flowers, bunnies and butterflies. A dreamy storage solution for pens, pencils, crayons and keepsakes, it is perfect for school or college! Sweet and petite; a must-have desk accessory!